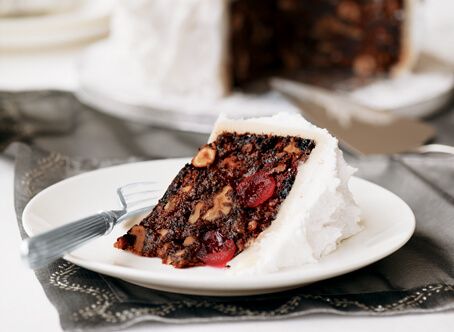 If you’re more of a purist when it comes to your Christmas cake, this recipe is the one for you. It’s packed with dried fruit and roasted nuts, and, of course, delicious French brandy! Soak the sultanas and raisins in about 150ml (5fl oz) of the brandy in a covered bowl overnight. Preheat the oven to 150ºC (fan 130ºC)/300ºF/gas mark 2. Grease a 20cm (8in) diameter deep cake tin with extra butter and double-line the base and side with enough baking paper that the paper stands a little above the side of the tin. Put the chocolate pieces in a heatproof bowl that fits over a pan of gently simmering water (the base must not touch the water), and stir until it melts. Leave to cool slightly. In the bowl of your blender/processor, using the power beater attachment, cream the measured butter and the sugars together at high speed until the mixture is light, pale and fluffy. Add the melted chocolate and then the eggs, mixing them in at a slower speed. (Add a little flour if the mixture looks like it may split.) Scrape down the side of the bowl occasionally, and mix until everything is incorporated and well blended. Sift on the flour and spices, followed by another 150ml (5fl oz) of the brandy along with the lemon zest and juice. Mix together well then stir in the fruit and nuts gently, without breaking up the cherries or walnuts. Top tip – When a recipe uses nuts or coffee beans, maximise the flavour by roasting in an oven preheated to 180ºC (fan 160ºC)/350ºF/gas mark 4 for 5 minutes. This will intensify the flavour and they will keep their crunch for longer. When combined well, spoon into the prepared tin and level the surface. Cover the top with a disc of baking paper and bake in the preheated oven for 3 ½ –4 hours or until a thin-bladed knife inserted in the centre comes out clean. Let the cake cool down in the tin, and then turn it out on to a wire rack. Peel off the lining paper and pour on the rest of the brandy while still warm. When cold, add some more brandy to taste, then wrap in clingfilm and store in a cool, dry place until ready to be decorated. This cake can be stored in an airtight tin for up to six months – but make sure you feed it regularly with brandy. When you’re ready, decorate it using the royal icing recipe and following the instructions below. The Christmas cake is at the heart of the festive celebrations so it’s crucial to get it right. To decorate, knead 450g (1lb) marzipan until soft. Roll out half of it big enough to fit the top of your cake, and the rest in strips to fit around the side. Brush the cake with a warmed apricot glaze then lay the marzipan on top and around the sides and trim as necessary. Cover and leave overnight. Make the royal icing. Spread it all over the marzipan with a palette knife dipped in cold water to create a smooth finish. Add more icing and use the palette knife to lift it into soft peaks. Dust with icing sugar…and voilá! Use British Lion Standard egg whites. If you are worried about using raw eggs, you can buy reconstituted albumen powder instead. Makes 500g (1lb 2oz). Tip the egg whites into a bowl and stir in the lemon juice. Gradually add the sieved icing sugar, mixing well after each addition. Continue adding small amounts of icing sugar until you achieve the desired consistency. For piping, the icing should be fairly stiff. Edible food colouring paste is highly concentrated, so only use a tiny amount. Dip a cocktail stick into the colouring paste. Mix well before adding more colouring paste to avoid streaks.